It’s quite frustrating to us when we have a great idea and other people have implemented it. Don’t misunderstand, we are happy strong ideas are arriving into the world, but we are disappointed that we weren’t the ones to make it happen. That being said, I should clarify. Biometrics on the Mac stink! No, another one of our ideas was not implemented without us, but close. I am talking about biometric scanning, of course. We are currently working on integrating the Ragnarok encryption algorithm along with biometrics to improve login security on Macs (Windows users, don’t worry, you’re next…followed by you *nixers). The best idea I have seen for the Mac is something called Red Hand and, although it is not biometric scanning, it is designed to be used similarly (only allow someone in your computer with either a piece of hardware or a password). Red Hand is phenomenal software that allows you to unlock your computer using a discoverable bluetooth connection and your Mac. Red Hand throws up a lock and won’t unlock without your bluetooth device in range or a password. Another feature that is enable-able is having it take a picture of the person logging into your computer through the built in camera or through an external camera…and you can tell it to only display this data when someone gets your password wrong (so you can see their picture…if it isn’t you). Problem with this…I want to use my iPhone 4s to unlock my Mac (because I almost always have it on me). To bad. The bluetooth in the iPhone 4s stops broadcasting in discoverable mode as soon as you leave the options in the General Settings menu, so I can’t use my iPhone to unlock my Mac. As I said before, we are working on certain biometric combinations that, along with Ragnarok, can validate a login and translate that into a password or just log in…we will let you know when we figure it out and it is viable. 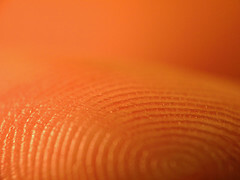 Biometrics on the Mac are not quite ready yet, and that is disappointing. Soon we will get some viable biometric options, but for now, we are left keying in passwords like we were in the early 2000s. Image by Kevin Dooley under Creative Commons license.